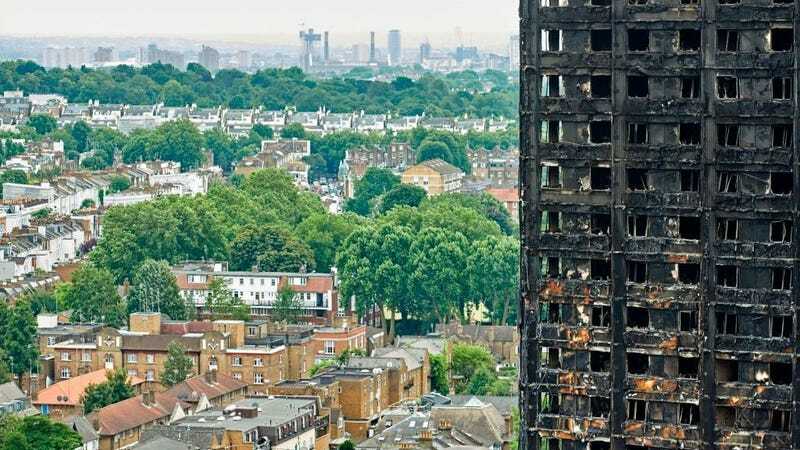 The UK is not happy that its government allowed a 24-story public housing building to be built under such abominable safety standards that 79 people died in a massive fire ten days ago. But will an anti-regulation US allow the same mistakes to happen here? The Grenfell Tower in London had many hazards that led to it being rapidly consumed by flames on June 14th. One major focus of criticism has been directed at authorities’ decision to use a highly flammable cladding on the facade of the building in an effort to “beautify” the neighborhood. The panels that were installed are made up of two sheets of aluminum and a polyethylene core. The fire is believed to have started with a refrigerator but the paneling reportedly caused it to spread throughout the tower faster than anyone could react. This was entirely avoidable because the same paneling with a less-flammable mineral core could have been used at a cost that some estimate to have been as little as £5,000. Reuters reports that 600 buildings in the UK that use cladding on the exterior are now being inspected. Most states don’t allow that particularly dangerous type of cladding on buildings that are taller than 40 feet because they follow the International Building Code (IBC). But NPR reports that a handful of them have rolled back the regulations that forbid it. John Valiulis is a fire protection engineer in Tusla, Oklahoma who has prepared a white paper detailing the areas that have permitted the cladding on the condition that traditional fire safety protections like working sprinklers are in place. According to his research, Minnesota, Indiana and Massachusetts, as well as the District of Columbia have all elected to exempt the cladding from testing that’s required under the IBC. Valiulis says that no fires on the scale of Grenfell Tower have occurred in the US, in part, because, “The fire protection engineering profession in the U.S. is quite active and is often very proactive.” But he fears that the good track record is causing us to become complacent. Matt Orlins, spokesman for the Department of Consumer and Regulatory Affairs (DCRA), tells NPR that the board chose to exempt the cladding because it was going to be difficult to find cladding that passed the test. Because the cladding specifications often change, each new building has to be tested and costs run around $30,000. Those who want to eliminate the testing altogether claim that the cost-savings make sense because there hasn’t been a ton of major fires in the US in recent years. Valiulis thinks this is nonsense. “When a code is well-written and properly anticipates problems, people observe a lack of incidents, and often assume that the code must be asking for overkill,” he says. Getting the code updated in Minnesota, Indiana and Massachusetts could prove more difficult. Builders should keep in mind that authorities in the UK are considering manslaughter charges for those responsible for Grenfell Tower. Better safe than sorry.